Once more, this semester we all have seen leaks from images about some new 2010 TECHNIC sets, popping in the internet during the last few days. Effectively this is not the best way of getting information nor any surprise at all. Much better if we get it in time, officially and through proper quality images, isn't it!? So, and because the TECHNIC team is also concerned with this phenomenon, while they also believe LEGO should be driving the novelty effect, TBs got today a double surprise to share with you, all the TECHNIC fans worldwide. At first and also in first hand, some preliminary images from the new 'Tractor with Log Loader' (8049), which will be launched in the beginning of 2010. Second the official confirmation that pneumatics are back to the mainstream TECHNIC sets. As you may see, these are still confidential and watermarked images, but we got the permission to publish them and so they are official. This unprecedented fact in the TECHNIC theme, is a strong sign of the commitment the respective team is putting towards its fans and how they have been listening what the same fans have to say. Below also some words and information, from Monica Pedersen (LEGO Technic Marketing Manager) about the new product, that you should want to read. 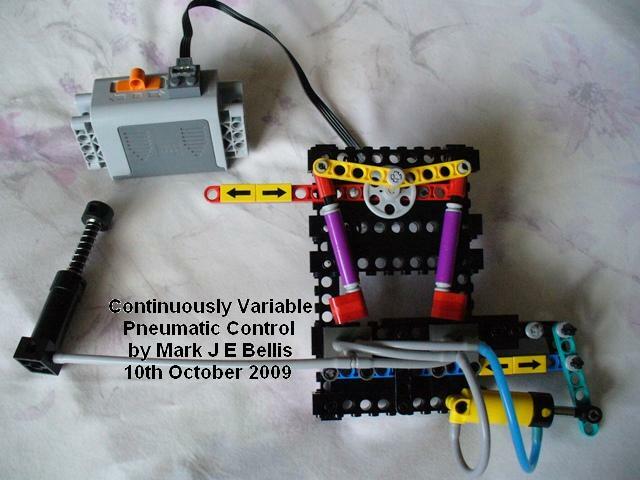 "As a special treat we would like to share a picture of one of the LEGO Technic novelties from 2010 with you. With the launch of the 8049 Tractor with Log Loader LEGO Technic is re-introducing pneumatics into our models. 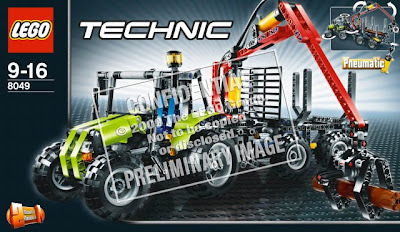 We have been listening to on-line discussions and wishes from our adult fans for some time, and as a consequence we decided to look into how we could use pneumatics in a new LEGO Technic model. After having tested different models with our core target group (boys 7-13) we found out that they really liked being able to play with pneumatics in this particular model and this is why the 8049 Tractor with Log Loader is launching in 2010. The Designer behind the model is Lars Krogh Jensen and he has been very excited about building with pneumatics again as it gives the Designers some new possibilities of adding functionality. It will also be very interesting to see how the product will be welcomed by our adult fan group, who has been asking for pneumatics for quite some time." Personally I'm very happy with the pneumatics return and hope the assortment of these elements may increase in the future. Also have enjoyed a lot, the color scheme used in this model. Now you just need to collect a dozen of spare logs, to get the complete fun play! It is also up to you now, to dissect the model images and find all the details about it, but please do not forget to leave your findings and opinion into the comments to this post. Now you know... someone inside is listening to you. I believe there will be more related news, but they will flow as TLG determines, hopefully! Thanks Monica, in the name of all the TECHNIC fans. And last but not least, thanks Lars for having designed this set attending to the fans wishes. Fantastic, Lego are a really cool company for doing this. It's very rare that such a large company would share its new products like this. So its got two Pnematics and a worm gear for the grabber. Looks like something yellow underneath the trailer, wonder what that could be? Actually, where is the pump for the Pnematic system? I am glad the tractor is different from the rehashed one this year. Similar, but nicely different! To me it looks the pump is the yellow element underneath the trailer. Hopefully not a tractor with a tipping trailer!! To be honest I'm rather disappointed with this. I wouldn't say this is a flag ship model for 2010 as the Truck was in 2009 and the bulldozer in 2008. I was expecting the model to be more linked together rather than a tractor and trailer. Maybe a similar chassis to the Dumper Truck (8264). From looking at the model it might have an air tank in the base with the pump linked to the wheels. there's quite a bit of blue down there. The base of the cylinders also look slightly different. The crane looks a bit flimsy and the model seems to have been designed really fast but it still looks very neat! I'll definitely buy this! A quite nice and working medium-size model. Yes - I noticed the pump under the wheels too - the problem with forward force for a pump is that you will move the model forwards, so will be interesting to see how it pans out - but I like it - it's a cool mini/midi tractor with an awesome mix of colour - and great to see the return of the pneumatic! I will buy this for sure! But the second picture makes me doubt about the presence of an airtank..
You can see blue around the base of the crane too, so perhaps the blue is the airline going to the pump, so that might be what we see instead of an airtank. Next semester would be set like 8868 air tech claw rig, with combination of pneumatic and PF elements. I like log loaders. But I won't buy this set. I like the power functions actuators more than pneumatics because I think they are easier to motorise and I don't like the pneumatic hoses because they make my models look ugly. And I also think all lime-coloured pieces are extremely ugly. A single stroke from the pump is enough to move a cylinder, so I don't foresee any problems with the pump. Also, the blue line definitely looks like an air hose and is consistent with LEGO Pneumatics colour coding. The arm is a bit flimsy and the model altogether quite simple, but this is the 'big' model for the first half, and should be compared to the Cherry Picker or Hauler. I've already seen the model announced for around 50€, but have no idea what the official LEGO price will be. Having said all that, first of all my congratulations to the TBs team for getting this great scoop, including official permission to post preliminary images. And is second place, a big hooray for all of us: Pneumatics is back!! First of all, thank you Monica and TLG for the kindness of sharing with the fans these early pictures! Not only for the gift itself of giving us the opportunity to see what's coming up, but also because that is a sign that you listen to and pay attentions to what fans think and say. It's gestures like this that set apart good companies from great companies. Whew, with that out of my system (the fact that I haven't eaten a single donut in a long time also helps), I can proceed. I share the opinion that the blue we see in the trailer is air tubes, not an air tank. For this application and pricepoint, I think an air tank wouldn't be very necessary. As for the pump, I think that placing it horizontally under the wheels is a logical choice. Having it vertical on the trailer would severely destabilise it when the user pushes down to pump air (since it is a trailer, the wheels are too close to each other to make a stable pumping platform), not to mention that it would be awkward in passing as a chimney. Having it horizontal, like on one of the 8436 Truck's attachments, allows the user to squeeze the pump, pushing with the thumb and holding the other end with the other fingers (or the other way around, depending on preference). I agree that the arm looks a bit anorexic, but from the pictures of real machinery I've seen, it's realistic. However, unlike real machinery, it doesn't appear that the claw can rotate around its "wrist". This is quite a limitation to how the logs may be oriented for pick up. Actually, the tractor's looks remind me more of the 8455 Backhoe (with the "tractor" colour scheme and the construction parts stripped out, of course) than the 8284 Tractor. I guess that, at 1H-flagship price range, it's safe to assume steering, differential and 4-in-line engine (although I have some doubts when looking at the pics). Also, I (and others, from what I've read) was expecting more like an articulated vehicle in the lines of the 8264 Hauler, like this one, but it would probably look too similar to such a recent set (with the consequent complaining from fans; we are a tough crowd indeed). As for the kids liking this kind of thing, I confirm: even a fellow PLUG member's daughter (who I think is younger than the 7-13 target audience) had a lot of fun playing and picking up stuff with the 8265 Wheel Loader B-model! Being a teenager, I only got into Technic after the pneumatic era. I've shelled out the cash to buy a couple of cylinders on Bricklink, but this set will be must-buy for me. I'm also thrilled that they chose to use lime-green; the people who criticize the colour frankly don't know what they're talking about. Perhaps my dream of a large lime-green Technic model will come true! I'm a little disappointed that this isn't an articulated forwarder, but as long at the idea is still on the table for the future, I can wait. Thanks LEGO, and thanks TB! I want a PF pneumatic valve!! Very nice from her to share this pictures! Are those new panels over the front wheels? P N E U M A T I C S ! ! ! I think every thing that I want to say has been said but thank you Technic team this is simply awesome and I really hope it sells well (I will deffinately be buying it anyway!). And thank you for the very kind gesture of showing us these pics. Thank you very much for listening and thank you TBs for existing!!!!! I for one am REALLY REALLY hoping that the assortment of pneumatic parts will increase in the future. 1)The end of the claw/grabber thing looks like it will have to be manually operated buy turning the black gear this is no fun at all ! why not just put a small pneumatic cylinder at the end to control the opening and closing of the claw you could use a technic shock absorber to hold the claw closed and then use the pneumatic cylinder to over come the shock absorber to open the claw. @Jernej: it appears the lime panels near the front wheels, which are used to make the sides of the motor compartment, are Slope Bricks Curved 2 x 4. One thing is for sure, judgeing by the amount of posts this thing has generated in less than one day shows just how much interest there is in this model. @Dark sheep, I do agree with what you are saying, but one thing about your second point is that I don't think that would be feesable within this price range, which may also be a contributing factor to your first point. I fully agree with Alexandre's comments regarding the position of the pneumatics pump and usability/stability comments. Past experience, tell us that's better to wait for the real models, to test which are and which are not the real issues. Photos are very good to tell us what's coming, check eventual new parts, techniques, etc... but can't tell us much about building and playability experience. Or at least they can easily mislead us. And yes, the tractor panels are made with 61068 "Slope, Curved 2 x 4 x 2/3 No Studs" part. "One thing is for sure, judgeing by the amount of posts this thing has generated in less than one day shows just how much interest there is in this model." No, the interest is in the pneumatics. I could care less about this model, looks boring to be honest. Firstly, kudos to LEGO for sharing this information with us. I can imagine how frustrating it is for them to plan a marketing campaign only to have photos leaked before they are ready. Thank you Monica for sharing with us! I'm very pleased that you are so committed to interacting with the adult LEGO community. Monica also did a great job of preemptively explaining why this particular pneumatic model was selected for production; because kids liked it! Great job of trying to satisfy both the core market and the AFOLs. Next, I can't imagine it has an air tank. Firstly, I don't think an air tank would even be that valuable here (it doesn't need one). Secondly, we've only ever seen two official models with an air tank and that was a long time ago. Finally, the size of this set indicates to me that part of the intention is to allow fans to get into pneumatics for a relatively low cost, which is great! An air tank would greatly inflate the price of the set. And nothing prevents a user from adding their own. Like the other posters, I am thrilled to see the return of pneumatics. Partly this is my own preference since I work with hydraulics for a living, but I also think it is important as an educational tool. Pneumatics and mechanical actuators each have their advantages and disadvantages, and now kids can discover them side by side. The design considerations for pneumatics are very different than for gear systems. Most Technic functions are based around gears and linkages, and this is one of the few exceptions that opens up the world of a totally different type of technology. I also think the return of pneumatics in a reasonably priced set will help bring down the price of cylinders on the second hand market. This has been a problem for both collectors and for businesses like LPE Power. I hope this makes it easier for them to keep producing their engines. The very first thing I will do to this set is add a small pneumatic cylinder to the claw so the whole thing can be operated remotely ala 8868. This will also require an extra valve. Next I'm going to need a LOT of 2x2 brown round bricks to make more logs. Maybe they should sell a "log pack". Finally, it is my fervent hope that this resurgence of pneumatics also indicates that, as LEGO starts producing them again, they will be available for sale. I'd like to see a section in the SHOP @ HOME catalog where cylinders, pumps, valves, and tubing can be purchased separately to add functionality to this and other models. A "pneumatic resource set" which had a little bit of everything (like the Education set) would also be good, but I'd rather be able to buy them individually. Long ago we had 5218, but its price is now exorbitant. In summary, Technic, pneumatics, the forest tractor, and Monica all rule. For the second half of 2010, I expect to see something like this. I'll definitely second having access to individual Pneumatics elements through LEGO. I've built up a small collection of Pneumatics pieces with a couple of 8455 and some other odds and ends, but you can never have too many of those cylinders and valves (ever since I started using valves by twos and threes...)not to mention the small ones!! Although SHOP @ HOME does not have them, I just took a look at the LEGO Education site and they are already selling large cylinders, large pumps, small cylinders, small pumps, switches, t-fittings, air tanks, and tubing individually. Air tanks are down to $7.50 each which is FAR better than the $50 they were getting on Bricklink. It's a bit of both worlds. Good as an introduction to pneumatics for kids and good as the answer to the many requests of the AFOL's. Let's hope TLC will listen to their many requests for a SUPERCAR too! I forgot to mention that I really hope the crane doesn't rotate manually, like the 8421 Mobile Crane: to me, a simple axle meshing with the turntable via a crown gear would suffice! The trailer with a pneumatic log loader looks like it has a good number of functions for its size. I get the impression that the 1H models are more geared towards boys 7-13 than the 2H models are. I say this because the 2H models always have interesting and more complex mechanisms (like the 8297 with moving engine pistons and motorised suspension), which don't really appeal to a 10 year old. The pneumatic log loader on the trailer looks fun to play with for a 10 year old, but looks kind of boring to build, as really you can tell from the photo how each function is going to work. The only function on this tractor is steering (unless it has some sort of lift arms hidden at the back, which looks very unlikely), which is disappointing after the 8284/8063 tractors, which had moving engine pistons, front suspension, working lift arms and the rear transmission axle thing for working attachments. I have always considered the 8284 tractor to be an amazing Technic set, especially for its size and cost, and in many ways I would rate it better than the largest Technic sets, including the 8275 bulldozer. I think the 8284 tractor deserved a rehash in 2009, especially after not selling very well in 2006-2008, but I wish the designers would put more imagination into the trailer, which was really too simple to be worthy of sharing the same box as the tractor. This new 1H2010 set made me think that if the 8063 rehash of 8284 had a log loader on the trailer, maybe using a PF XL motor with transmission driving rings and linear actuators to control the crane arm, like on the 8258 crane truck, the result would be 1800+ pieces and a potential Technic flagship (I mean in terms of size and functionality, a tractor flagship probably wouldn't sell very well). The one thing I like the most about 8063 is that it has so many unnecessary (in a good way), but realistic features, for example in this set the lift arms and transmission axle are not really used at all, but add a feeling of authenticity to the tractor. The reintroduction of pneumatics is certainly reassuring, as I was beginning to think that pneumatics had gone for a long time, since they seem to have been replaced by linear actuators. I certainly prefer the use of pneumatics in small models like this, but in flagship models I prefer linear actuators, because I think it is much harder to design a good Technic set with linear actuators than it is with pneumatics. The transmission from the motor to the linear actuator can often be very complicated (8294,8265), which makes the model seem much more like an achievement than if the designer had taken the easy route by using pneumatics. I have a strange feeling that the 2H2010 models will only include pneumatics and no linear actuators, which would be kind of disappointing, especially because the linear actuators have only been around for 1 year. Having said that, if a lineup of pneumatic models means the introduction of a PF pneumatic valve, and therefore motorised pneumatic sets, I would not be disappointed, and would happily buy the 2010 pneumatic flagship model (hopefully a backhoe loader like 8455 , but a much bigger model with motorized compressors). This new model looks like one of the best 1H2010 models for a while, especially aesthetically, but also I think it will be much more interesting for 7-13 year olds than other Technic models because of the pneumatics. I forgot to mention in my last comment that the wheels on that tractor are the same as the wheels on the new 8048 Buggy. If the B-model of the 8048 buggy is a tractor, it must be similar in size to the 8049 tractor, but it is likely to have front suspension and maybe a moving engine. Personally I find the 2010 tractor disappointingly simple, so the 8048 B-model (if it is a tractor) could be a good substitute. 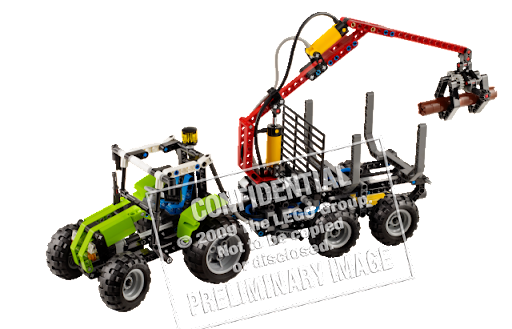 We probably wouldn't have this set unless TechnicBricks constantly pointed out that us fans expect the return of pneumatics. Thank you TB and thank you TLG ! Personnaly I think the only model in which I would prefer linear actuators is the 8258 because of the complex gear trains. Other than that I think that any model that has linear actuators should have had longer pneumatics instead. So hears hoping that the return of pneumatics will bring longer pneumatics, PF valves and a bunch of other new pneumatic parts in future. I wouldn't go so far! New sets are planned by TLG with a big advance. However I would not be surprised, if the frequent comments here left by fans would had some influence showing they are a popular and missed function. Despite I'm the first loving to get some PF valves, I have some doubts we would see them from LEGO, even if they agree with us. I doubt LEGO would integrate any electric solenoid valve into a PF element if they won't find it of-the-shelf in appropriate size, power, form factor, and DC supply rate. Also solenoid valves that mimic the LEGO valve would be something complex as you would need two 3-way valves or some more esoteric valve types (4-way, 5/2, 5/3). I've been doing some investigations on what's available in the market, but it won't be easy!... (wip). but with a solenoid on each end with some simple circuitry. I imagine it would be similar in cost to the XL motor although, not as versatile in it's uses. In fact didn't remember to have seen that valve in that folder before (maybe it's new!?). Had another look at the pump / air tank discussion. If you have a look at the picture of the box you can clearly see the pump sticking out the back of the model with an in-out arrow. This is awesome. I really hope they make some new parts. It would also be great if they could link the pneumatics to the NXT and create a type of Soleniod valve. That's cool Chris (Shep) and raises another important issue about solenoid valves and LEGO. For many applications of those into TECHNIC models, it would be better to have other type of remote than the current ones we have now (bang-bang and speed remote). One more PF element to the system... that may appear sooner or later anyway. This puts in fact any eventual LEGO solenoid valves, closer to the NXT platform than the pure TECHNIC line, I would say. Pneumatic hibernation is complete... Yeah!!! and echoing other AFOL's, thanks to TLG et al, especially for leaking it early. Since this has become a wishlist discussion and since it seems we all assume that TLG will be reading this specific comment thread, why dont I just go ahead and state the one and ONLY desire the entire lego community is begging for. Twice as long, in fact! YES JAMS. If I could only have one size available it would be one that is 2-3 times the length of the current one. If they do that I'll be more than happy! Personally I would easily prefere this to even a PF valve. Of course the ultimate would be to have a range of lengths ranging from the current stubby length (for use in small models/applications) all the way up to 6-8 times as long (for use in telescopic booms, forklifts, and many other things). The custom ones in this video I link to below are plenty smooth enough for me weather under load or not. I WANT SOME OF THESE!!!!!! BTW thankyou again TB's for giving all of us hear a voice and thankyou Lego for listening! In fact, in addition to a piston that is 2-3 times longer (likely 3 times longer), it would be nice to have a 1x1 width piston, to add to the mini piston we currently have. But it needs to have a metal shaft (for strength), and be twice as long as the current small piston. @JAMZ: Actually I disagree. I too wish for longer pneumatic cylinders (maybe even thicker ones to allow for heavier loads), but personally I prefer PF control of pneumatics. That would tremendously ease the construction of electrically-controlled (remote or not) pneumatic machines and robots. Of course, if LEGO made both, everyone would be happy. ;) Besides, the basic moulding for cylinders is already done, it wouldn't be very hard (I guess) to extend a cylinder's body mould and piston rod a bit (extending too much would weaken it too much to handle high pressures). They exist in all combinations of diameter and lengths (course). I am currently investigating on that. And others have also used them too. @Conchas: Let us know when you find out!! @AV: The only reason I would prefer new pneumatics over a PF valve, is because you can already make an auto valve for your MOC. Larger pistons do not exist in the lego world, you have to piggy back those guys but that doesn't help much. note to TLG: PF control of pneumatics (and other cross-breeding) would increase sales bigtime... especially with the above suggestion of a pneumatic elements section on S@H.
I personally have many of both elements, but combining the two would force even myself to buy more stuff. Just hope its a possibility, from Conchas' comment above it seems difficult (wish we could be a fly-on-the-wall at TLG). Before we move on to longer pistons let's first get the smaller pistons back in the assortment. If normal pistons are expensive, the small ones are daylight robbery! I'm trying to see it from TLG perspective, and MOC auto valves dont fit into most technic sets nor cater to TLG's target audience (which we are not). Combining pneumatics with PF would feed on the PF craze and increase set sales. Maybe it worths trying to look into this, with TLG eyes. TLG will never make longer cylinders, only for AFOL and MOCs usage. They must fit into the official TECHNIC sets. Long stroke cylinders could only make sense for large size models (eventually some medium size ones), which makes their application quite limited and unlikely to be used in several sets/large quantities into the same year. The brackets are useful indeed. However the result was not very realistic for applications like in 8421. The only set where they were used to extend the normal cylinder, making a double rode cylinder. The "problem" with longer cylinder is that they are needed mainly for large and heavy elements, where momentum will require longer stroke to reduce the force to apply. And this would happen with very large and high part count sets, which are not released so often. There's a number of excellent MOCs using the double cylinder technique, even before the brackets were introduced. In order to design a new part LEGO would have to see that the existing part or a combination of existing parts is not an 'easy' solution and that creating the new part is economically feasible. I sincerely doubt that will ever happen. There have been longer pneumatic cylinders though, There were 4 Technic sets that used the 64mm single action pistons. I'm curious why that length was never released in double acting cylinders. In fact even the short version had a slightly larger stroke, than the actual design. Although both had a plastic rod. The length of the stroke had to be shortened to allow for the second input port (the top one). If the rod goes too far up the internal packing would block the top port and thus not allow air to enter, rendering the cylinder useless. As an additional advantage the packing in the top of the cylinder made it more rigid and so allowed for less bending between cylinder and rod. As for micromotors :D Since we have XL and M, it would only seem logical to think there might be an S motor as well. However, it would need to have considerably more torque than the old micromotor to be really useful. I believe I'm not the only one thinking LEGO had a reason to call the two motors we know "XL" and "M" instead of "L" and "S". ;) "XL" could have been used instead of plain "L" for marketing reasons, to give an idea of sheer power, but complementing it with "M" sounds so... incomplete. I don't doubt that sooner or later a PF motor smaller than M will appear. @Jetro: Sure, the 9V micromotor's applications have always been limited by its low torque, but, even with that, it's been very useful. Even if a PF micromotor is as weak as this predecessor (which, seeing that newer LEGO motors are in general more powerful than older ones, like Philo shows, isn't likely), it would still be incredibly useful! I would love a PF pneumatic valve very much so and it would make me very happy however I think it would be a bit too impractical from the eyes of TLG. The only reason you would need one is in a completely remotley controled pneumatic vehicle (drooooool!). But just think of everything else it would need to have. A motorised compressor, air tank, auto pressure cutoff switch and a valve for every pneumatic funtion, the complexity of which would be possibly greater that any current PF element. A longer pneumatic would only require a longer rod and main body. So whilst I would love a PF valve, I think a longer pneumatic would be a more viable and versatile way of adding greater potential to the pneumatic range. Besides, to create a PF valve that would give you true proprtional control like the current valve does would be very very complicated and expensive for lego to mass produce. One more versatile alternative to a PF valve could be a proper servo motor that could be used to presisly control the posistion of a standard valve (I guess it would have the ability to go far left/centre/far right with 6-7 steps in between each position) but could also be used for steering and moving linkages for all kinds of mechanisms. Yes indeed this has fast become needy of a whole new topic for dicussion. @Conchas a forum may be quite an interesting idea indeed! Good set! Hoping Lego combines PF and pneumatics to make a type of IR controlled zero-turn. Zero-turn? I googled and came up with a kind of lawn mower. Where do Pneumatics fit into something like that? I'm not sure I undersatnd what you are trying to say, but automated pneumatic constructions are not tthat complicated to make with LEGO. The 8868 b-model has a pneumatic loop and in the last TBs post there are a number of videos of Pneumatic creations that work on automatred control circuits. "Complex control systems using valves requires an automatic control based input of an actuator. The actuator strokes the valve allowing the valve to be positioned accurately and allowing control over a variety of requirements"
I believe he is refering to an older topic, part of which relates to the smooth and precise operation of a pneumatic cylinder. I didn't read all 72 comments to see if this has been posted, but i know there was some comments about Lego expanding the PF line of components. All the elements shown in that video are already available! The ones not mentioned are the 8871 Extension Cable, the 8885 IR Remote Control, and the elements in the WeDo set. He says that there will be more battery boxes (why plural?) available and after he stacks the LED light and the Medium motor, he says that there will be more Action elements. I think this is an update to a former video. The fact he mentions there will be more action elements, is not really a surprise. Despite we don't know exactly what, it is normal to expect new elements will come. And with so many ideas discussed here at TBs overtime, at least for some we get a chance to be right. As for the battery boxes (plural) and considering we already got one not in the video, either it was a misspell or we really will get something new for the futture. - A smaller box for 6x AAA batteries. - A smaller box fo 1x 9B battery like the old one. - A smaller rechargeable battery. All these addressing needs of more compact applications. A PF pneumatic valve would cost more than the elements you can make it from (medium motor, 24mm pulleys, pins, lever, pneumatic valve). The solenoids for such a valve would have to be powerful to move the valve load, making them large. The valve has to stop in the middle as well as at each end, so you need 2 independent solenoids and to power both to move the valve to the middle - larger still. The 12V point motor solenoid unit was 4x8x2 and was quite weak, and such a large unit would be unfeasible. A PF medium motor has the right amount of power for this application. The total element cost is about £10, so let's get building PF-motorised pneumatic valves! The 8455 Backhoe had nearly enough parts but needed 2 more valves. I like your excavator Jetro. After the 8868 B-model, I was inspired to make all the electronic logic gates from pneumatics http://www.brickshelf.com/cgi-bin/gallery.cgi?f=141478 . My robot uses an exclusive-OR gate to control a 3-variable loop and to make a 4th variable move twice in the loop sequence. I always wanted a 4-port valve, that does a genuine 5/3 industrial valve function and puts 4 valves of a reverser http://www.brickshelf.com/cgi-bin/gallery.cgi?i=1417352 into one and means it needs only 1 piston to drive it. Longer cylinders are good too, but a telescopic one would be great (increase the ratio of extension to original length)! I made one with 6 compressors and it worked well. Looking forward to more pneumatic fun in 2010. Hi Mark. Great to read you here! Your BS folder has been a great inspiration to me even if there are many things I don't quite grasp yet. So far I have never been able to find an excuse to use more than 2 valves with a single cylinder. I saw the pick and place robot some time ago (when you announced it at LUGNET? )and I'm trying to do something similar for a GBC module. Jetro, glad to have inspired you! To celebrate the return of pneumatics for 2010 I did a new experiment, whose results could be wide-ranging. Here are links to pictures of my latest pneumatic system. It allows the cylinder to be commanded to any position. - yes, any position within its travel! The variable input is at the red sliding beam. The variable output is the position of the turquoise lever. This uses no more pneumatic or PF parts than the contents of sets 8049 and 8293, so the parts will soon be quite accessible. How it works might take a little more understanding! More detailed description / info here. Pneumatics has just gone analogue! It is no longer just a 2 or 3-state system. Wow! That deserves a whole new TBs post!! Would need to try it first, in order to be able to comment. The design of this system aligns with standard industrial control theory and practices. - The amount of dither uses a 0.5M crank. More without longer valve lever extensions would make the system more jumpy. Less with shorter levers might be better, but then it's a proportion of valve lever load to motor speed. - If the dither is too fast, the valve seals might wear out quicker. - The amount of feedback should not be too high or the system will oscillate. This may be used intentionally, perhaps in a show car that has oscillating suspension. When powering pneumatics, the valve, if used on the edge between "on" and "off", can vary the pressure to the cylinder port, but this can change only the force per unit area in the cylinder and hence the acceleration of the cylinder against the load (F=ma). This is the double integral of the actual cylinder position, which we want to control. The feedback uses the position of the cylinder to vary the valve position, so the cylinder differentiates the pressure to produce the feedback signal. If the feedback gain is sufficiently low (40% on he turquoise lever in this case), the system will be stable and the cylinder will hunt for the desired position because of the integral in the loop. This is why too much feedback gain causes the cylinder to oscillate, because the hunting is too great. 1. Truck suspension with centre-lift or tag axle - apply more force to the other rear axle when the wheels are lifted, but distribute the force to both axles with the lifting axle down. Allow the axles to move and the system will push back on the deviation from level. 2. Variable height suspension on a 4x4. 3. Anti-roll suspension, by applying more pressure to the outside wheels when cornering. 4. Power Steering - add direct mechanical connection to avoid disparity between steering wheel and wheels. 5. Walking robots - leg pressure balancing, body movement to balance a biped.